The Center for Hellenic Studies — Studying the history, literature, archaeology, and culture of the Greek world across time and space. As 2018 draws to a close, we celebrate the many successes of the Center for Hellenic Studies and its affiliate students and faculty members. Since the beginning of the academic year two of our graduate students, Blythe Greene and Juan Carmona Zabala, have received their Ph.D. Blythe Greene's dissertation,"The Imperfect Present: Stoic Physics of Time," was advised by Monte Johnson, an affiliated faculty member and Director of the Classical Studies Program. Juan Carmona Zabala's dissertation, "State Expansion and Economic Integration: A Transnational History of Oriental Tobacco in Greece and Germany (1880-1941)," was advised by Thomas Gallant, the Nicholas Family Endowed Chair in Modern Greek History. Along with Lance Mylonakis, who defended his dissertation last spring, these are the first graduate students to receive their doctorates, a major milestone in the development of a world-class Hellenic Studies center. Our faculty continue to expand our reputation. Edward Watts, the Alkiviadis Vassiliadis Endowed Chair in Byzantine History, just published a new book, Mortal Republic: How Rome fell into Tyranny, and has been interviewed by local, national, and international news outlets about what lessons we can learn from ancient Rome. We have planned an exciting program for the 2018-2019 year, which includes lectures, workshops, and celebrations. The program will be updated throughout the year. 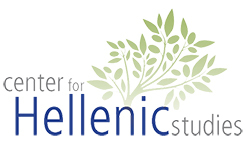 The Center for Hellenic Studies is a core part of the university's mission. We look forward to to strengthening our networks with other scholars and institutions and promoting excellence in cutting-edge research. Thank you for your support and I look forward to seeing you at our events. Nate Aschenbrenner, a PhD candidate at Harvard University, will discuss the political and ideological consequences of Byzantium's imperial demise in Europe. His talk will argue that western intellectuals appropriated Byzantium's imperial legacy in surprising ways after the empire's destruction, and in doing so they sketched distinctive and enduring frontiers for European, Christian, and Roman imperial identities and invested Byzantium with a renewed relevance for early modern Europe.